This year, for the only the third time in 50 years, two offensive linemen from the same school were selected in the top 10 picks of the NFL Draft. The Indianapolis Colts drafted guard Quenton Nelson 6th overall and the San Francisco 49ers drafted tackle Mike McGlinchey 9th overall, both hailing from Notre Dame. While this is no doubt an impressive feat in and of itself, it becomes even more impressive when you consider that Notre Dame has had an offensive lineman selected in the first round in 3 of the last 5 years (Zack Martin in 2014 and Ronnie Stanley in 2016). So, what gives? Has Notre Dame simply gotten lucky on their recent string of OL recruits? While good recruiting mixed with a little luck is definitely part of the explanation, there is one variable that has remained constant over the five year period of sustained OL success: Harry Hiestand. I contend that the biggest reason for the success upfront at Notre Dame is Harry Hiestand and his ability to teach both individual technique and simple run schemes incredibly well. Last season, Notre Dame finished 8th in the country in rush yards per game. What’s even more impressive about this statistic is that that nearly all of the teams ahead of them were option-centric teams, while Notre Dame establishes the run game with a simple inside zone scheme. So, what exactly do I mean when I say ‘Inside Zone’? There are an infinite amount of variations of inside zone that can be run. The one diagrammed above incorporates a quarterback read to hold the backside defensive end. The point of the diagram is not to show this particular variation, but rather, to show the combination blocks that ideally will occur between the backside OT & G and the C & play-side G. When the backside DT is lined up as a 3 technique (in between the guard and tackle, shaded onto the guard), with a front side 2i technique (in between the center and guard, shaded on the guard), there are two easy double teams up to the second level defender. These double teams are the lifeblood of any inside zone play; if you get movement on the DTs and account for the second level defenders, your play will be successful. Notre Dame executed this concept up front better than nearly any college program I have ever seen. Does it help that they had two top 10 picks working on double teams together? Obviously. Yet, the technique that they display is exceptional and can directly be attributed to the coaching they have received from Hiestand. My college offensive line coach used to drill this phrase into us when it came to double teams: “hip to hip, shoulder to shoulder”. This ensures that you are working in unison, in the same direction, making sure the down lineman cannot split you, and gives the OL that is not peeling off onto the LB a chance to take over the block and stay engaged. Watch how square both McGlinchey (LT #68) and Nelson (LG #56) are to start the play above, their shoulders are nearly parallel. This allows them to move the DT off the ball and gives McGlinchey the ability to stay balanced and easily come off on the LB while Nelson remains on the DT. Furthermore, the play-side double team is nearly as good. Again, both hip to hip, shoulder to shoulder, ready to account for both the down lineman and the LB. This is how you coach an inside zone double team. Double teams are easy when the defenders stay put. Conversely, the hardest thing to do when running inside zone is to block movement. Doing so requires you to stay balanced, disciplined and remain on your zone track all while maintaining ‘man awareness’ and understanding that your responsibilities may shift. You must have awareness for the individual defenders, but not chase somebody who has abandoned your zone. Both Nelson and McGlinchey execute these fundamentals perfectly here. Nelson takes the necessary steps to double team the DT, but instead of chasing him when he slants to the C gap, Nelson simply stays on his zone angle, tracking the LB until the point of contact, where he then aggressively delivers a beautiful two-handed punch and finishes him into the ground. McGlinchey’s fundamentals are equally as impressive. As a tackle on a double team with the guard, you are the designed ‘drive man’. The guard’s job is to post up the DT and the OT comes in violently to create movement off the line of scrimmage. A line must be toed by the OT where he is coming in aggressively enough to move the down lineman, but is on balance enough to handle movement. This is exactly what McGlinchey does. He takes a step in which he is ready to double team the DT, feels the movement, stays on balance and walls off the defender, giving the ball a crease to go. When you run inside zone, the RB’s typical aiming point is the front side hip of the center. However, as opposed to many other schemes, very seldom does the ball actually go where it is ‘supposed to’. For instance, in a power scheme, 9 times out of 10, the ball will follow the pulling guard, behind the front side double team. This is not the case with inside zone. It is the job of the offensive line to create movement, block all the defenders they are responsible for and allow the running back to find a natural crease. While this play is designed to go to the right, Notre Dame’s creates so much distortion moving that direction that a natural cut back lane to the left emerges. Look how in-sync the line looks, all moving on their zone angles and accounting for all the necessary defenders. While many of the above plays contained some fantastic individual efforts from exceptional players like Nelson and McGlinchey, this play, across the board, is how inside zone should look and that can be attributed to coaching. A similar sentiment exists here from the previous play. This play is really devoid of a truly great individual effort. It is just five guys, on the same page, doing their job. Again, it is plays like this where coaching truly shines through. For instance, the RT does not block the man he is originally responsible for. His defender completely over scrapes, but instead of chasing him, he simply stays on his track and blocks the defender who shows up in his zone, allowing RB Josh Adams to break loose for six. The best offensive linemen are not that ones that do anything particularly flashy. Rather, they are the ones that do the simple things extremely, extremely well. A guard who can pull in open space, track down some defensive backs and make a highlight reel block is all fine and well, but it means nothing if he can’t execute the fundamentals required on a basic inside run play (or he can do both and his name is Quenton Nelson). The Notre Dame offensive line embodies this sentiment. They take the simplest of run concepts and run them as well as anybody in the country. When the entire line consistently flashes the ability to execute a particular concept at an extremely high-level, it can be directly attributed to the coaching they receive. You probably thought that I was going to start with a McGlinchey or Nelson highlight, didn’t you? While this would have been the easy way to do it, and I will cover both of them below, it shows more about Hiestand if I shine the spotlight on some of the less heralded players on the Notre Dame OL. The players to watch here are the RT and RG. This is a phenomenal double team. As mentioned above, it is the job of the OT to be the drive man on a double team. The RT here executes this technique perfectly: he comes in violently, but on-balanced, and drives the defender 4 yards off the ball into the lap of the LB, allowing Josh Adams to break free. The best thing a double team can do, surprisingly, is not block both the DT and the LB. Rather, the best thing that a double team can do is knock the DT so far off the ball that the LB does not have a place to fill and is taken out of the play without ever being touched (look at #37 on Temple). What do you know? More inside zone from Notre Dame. The player to watch here is Quenton Nelson (#56). While you have probably all seen his crazy suplex-style blocks that have made him famous, I contend that it’s plays like this that make him so special. This is the most basic thing that you can ask a guard to do, a 1 on 1 drive block. Despite being ‘basic’, it also one of the most difficult things you can ask a guard to do. In order to move a defender, by yourself, you must use superb technique. To put it bluntly, this is some of the most picture-perfect run blocking technique I have ever seen. The three things to look at are Nelson’s feet, hips and hands. Nelson keeps his feet apart through the entire duration of the play, snaps his hips on contact and shoots his hands right under the defender’s chest plate to control the block. You can keep going down the coach’s checklist of what to look for in a run block and Nelson is executing it in spades. Elbows tight to the rib cage, check. Weight on the insteps on the feet, check. Powerful, positive-moving steps, check. Strain to finish the block, check. The point is, it would be hard to draw up better run blocking technique. It takes a special player to execute this technique, but it takes a special coach to teach it to him. For a college OT, McGlinchey is incredibly polished, especially in the passing game. The best pass sets are ‘smooth and quiet’. Look at how ‘quiet’ McGlinchey’s movements are. His arms are not pumping to help him move back, his kick steps are quick, powerful and not over exaggerated, and his upper body is relaxed but upright. The less variables or moving parts in a pass set, the better. You want to be relaxed, but ready to strike. You want to move back quickly, but be balanced with your feet apart. It may sound counter-intuitive, and may be hard to explain, but you see someone like McGlinchey do it and it becomes a little more clear. Blocking in space is not easy. You are asking a 300+ lb. man to block a much smaller, much more athletic defender while moving and trying to stay on balance. You may think that the secret to success as an offensive lineman in space is to have an extremely athletic offensive lineman. While, obviously, this helps, the real secret is in technique you use and discipline you display. My OL coach used to give these coaching points: meet him where he is going to be (if you try to just outrun him, good luck), wait until you can step on his toes to block him and at the point of contact you step, dip and strike. All of these tactics are designed to give yourself, as a much lesser athlete, the best chance to block a far superior athlete. Well this is exactly what Nelson does. He pulls at the perfect angle, waits until the last second and then steps, dips and strikes the defender, giving the ball a place to go. The uniformity of excellence across multiple positions and multiple different techniques cannot simply be attributed to great players. Between the way that Notre Dame so effectively ran their base run schemes and the success of the individual players, an argument can be made that the secret behind their recent string of OL success may be the man coaching them. 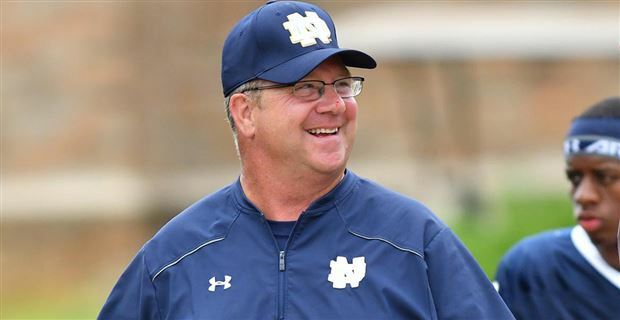 Like any great player/coach relationship, it remains unclear where the lionshare of the credit belongs, however, with this recent string of success upfront at Notre Dame, one thing is for sure, Harry Hiestand is a hell of a coach and Chicago got a great one.